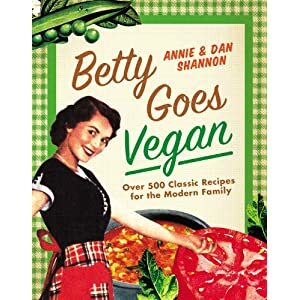 Meet The Shannons: The Betty Crocker Project hits it's First Anniversary - Let's Celebrate with Vegan Spanish Chicken! Make your Brown Rice per instructions on the package. Heat your oven to 400. Put your Vegan Chicken in a glass baking dish, and spray with Olive Oil Cooking Spray with a light even coating. Then bake for 15-20 minutes. Half way through flip your Vegan Chicken once to make sure they bake evenly. Remove them from the oven once they are golden brown. In your loyal cast iron skillet, heat your Olive Oil on a medium heat. 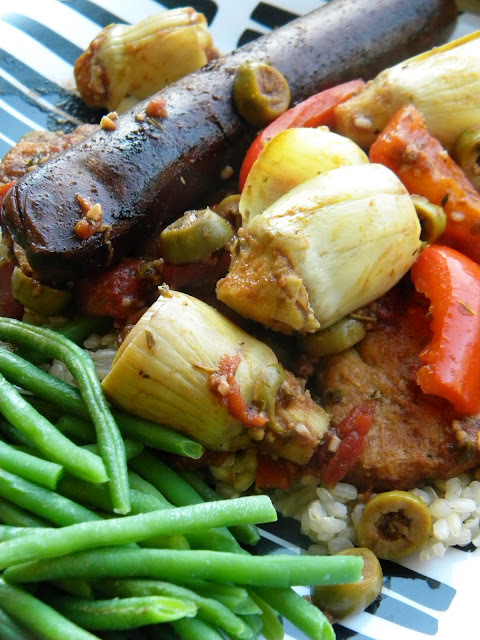 One your Oil is hot, add Tofurky Italian Sausage and Red Wine. You'll want to cook your Sausages evenly in the Red Wine. As it cooks, you'll notice a deep red coating form on the Sausage from the Red Wine reducing. Remove your Sausages when they are browned and have a heavy even coating. Then add your Red Bell Pepper, Garlic, Diced Tomatoes, Oregano, Braggs and Cumin to the Olive Oil and what is left of the Red Wine. Stir constantly. Once your sauce begins to bubble, add Artichoke Hearts and Olives and then cover and cook for another minute. To serve, place Vegan Chicken and Sausages over your Rice and then cover with your Sauce... and smile because no animals were hurt in your Double Mock Meat Dinner and that's pretty cool. *Yeah, I know it's "HO!" but I was worried you guys wouldn't get that. **When I say "successful" I mean able to really make a difference for animals and influence and encourage others to. That's what matters to a career animal advocate. *** You all might know her better as Lobster Killer. PS - Time is running out to enter to win some FREE METHOD PRODUCTS! Enter today... No regrets! I found out about your site from Veg News and I'm so glad I did! It's funny with down to earth recipes and I've enjoyed the ones I've tried so far (Hopping John, the cupcakes, pizza dip - yum!). Hope you compile this into a cookbook soon - you are a vegan superstar on the rise! I wanted to say thanks for all of the effort you've taken to making my favorite childhood recipes available to my family. I've recently become vegan and stumbled upon your website while cruising the web for family-friendly vegan meals. I've tried several of your recipes to rave reviews from my meat eating stepson and look forward to trying many more. I can't begin to tell you how much I appreciate your website! Happy Anniversary! You rock! I can hardly wait to try Vegan Spanish Chicken. Happy Anniversary, I've been following you for a long time now and love what you've done with Betty's Book!! !